As the column of seven Guard battalions in a “dark waving forest of bear-skin caps,” seventy-five men abreast, supported by two batteries of horse artillery, advanced, they divided-apparently by accident-into two separate columns. While General Friant’s grenadiers in the front part of the column continued forward, the chasseurs under General Morand peeled off to the left. They immediately came under heavy fire by Allied guns and Chasse’s 3rd Division of Dutch-Belgian infantry, as the main body continued forward where most of Wellington’s troops still lay concealed once again behind the banks of the Ohain road, just ahead of them. Meanwhile, to their left the chasseurs unexpectedly found themselves facing General Adams’s light brigade, as it emerged abruptly from the cornfield before them, while Colonel Colborne’s 52nd fell upon their left flank with a stinging fire, startling and momentarily halting the entire French advance. Taking advantage of the moment to rise from the concealed embankment, Wellington in his blue coat, white buckskin breeches and gold Spanish sash, waved his hat, signaling the Allies all along the front to counterattack. Less than sixty yards away, some 40,000 Allied troops appeared as if out of nowhere, firing a steady stream of lethal volleys into the exposed front ranks of the astonished Imperial Guard, and then shouting, charged with bayonets as the remaining two brigades of Allied cavalry under the command of Generals Vivian and Vandeleur swept across the road. Despite Ney’s repeated orders to advance and the Guard’s drummers rolling out the “pas de charge,” the marshal’s troops and frontline Imperial Guard broke and fled for their lives. A desperate Napoleon hurriedly formed his last three Guard battalions into squares in the very path of his fleeing troops, but even he could not stop the massive flight, and all gave way as this immense wall of humanity poured forth, their cries of “Vive l’Empereur,” now replaced by “Sauve qui peut!” [Everyone for himself.] At the same time on the other side of the Bruxelles-Charleroi highway, the Young Guard managed valiantly to hold on to Plancenoit under a heavy Prussian barrage for another couple of hours, thereby covering the escape route to Charleroi for the precipitous retreat of the Armee du Nord. With the Old Guard’s withdrawal completed by 8 P. M., a dazed and gloomy Napoleon Bonaparte himself turned away from the battlefield of Waterloo and his extraordinary defeat, and “entirely disappeared,” as Ney put it, without having notified him or the other field commanders of his plans. The crush of the troops in their southerly retreat became overwhelming as the imperial coaches and Napoleon’s famous dark blue and gilt berline were seen fleeing the scene. “A complete panic at once spread throughout the whole field of battle,” reported one official version of the battle, as the greatest army in the world broke and fled in “great disorder” before the “issue funeste de la bataille” [“fatal outcome of the battle”]. “In an instant the whole army was nothing but a mass of confusion . . . and it was utterly impossible to rally a single unit,” Ney admitted. Napoleon had abandoned his army in Egypt and in Russia and now again at Waterloo. “All was lost by a moment of terrifying panic. Even the cavalry squadrons accompanying the Emperor were overthrown and disorganized by these tumultuous waves,” said the official Army report. And Ney, much bruised from his last fall and limping painfully, covered in mud and exhausted-with not even one of his staff officers willing to help or offer him a mount-now followed on foot swallowed up in the mob. “I owe my life to a corporal who supported me on the road, and did not abandon me during the retreat,” that marshal acknowledged. Meanwhile, with some British and Prussian cavalry units already hard on their heels, it took Napoleon and his staff an entire hour just to clear the bottleneck over Genappe’s narrow stone bridge spanning the Dyle, where artillery limbers, caissons, carts and horses were locked together holding back the entire French army. Indeed, with the sudden blare of Prussian cavalry trumpets and the rush of Gneisenau’s dragoons, Uhlans and Pomeranians around the imperial cortege, Napoleon himself barely escaped capture, as he leapt from his berline onto his waiting horse. Leaving behind a fortune in gold, bank notes and diamonds, including his sister Caroline’s 300,000-frane necklace, personal papers and hat, he galloped off down the Charleroi road followed by Drouot, Bertrand and his staff. But upon reaching Quatre Bras, instead of finding Girard’s reserve division (ordered earlier from Ligny) waiting for him, he came upon over three thousand French soldiers, long dead, in immense rows, completely stripped of their clothing and possessions by scavenging French and British soldiers and local Belgian inhabitants, their white bodies bruised, mutilated and streaked in dry blood, rigid and refulgent in the June moonlight. With no organized French units left around him, nor word of Grouchy, and Gneisenau’s troopers again fast approaching, a tearful Napoleon mounted his horse and continued to lead the French retreat from Waterloo. But as tired as he was, the dismal sight was too much for Napoleon, who, setting out an hour later, reached Philippeville at 9 A. M. (the nineteenth). Here at least he hoped to find some semblance of order and see his army units regrouping. Instead he found unabated confusion and only 2,600 men from a dozen different regiments. But at least his staff and commanders began to drift in, and he soon had with him Bertrand, Drouot, Dejean, Flahaut, Bussy, Bassano, Fleury, Reille and Soult. For the first time since the end of the battle Napoleon was able to dispatch orders to commanders he had abandoned, as well as to nearby garrisons, where he hoped to assemble his cavalry, artillery and infantry. In addition he now dictated two letters to Fleury for Joseph Bonaparte, acting as Regent in his absence: one for his ministers, the other personal. Explaining briefly what had transpired at Waterloo, he said-“I believe the Deputies will be made to understand that it is their duty to join me in saving France . . . All is not lost by a long chalk. . . . I shall call up one hundred thousand conscripts. The federes and the National Guard will provide another one hundred thousand men. . . . I can call up a levee en masse in Dauphine, at Lyons, in Burgundy, Lorraine and Champagne. . . . I shall soon have three hundred thousand soldiers under arms with which to face the enemy! . . . Then I’ll simply crush them once and for all!” Still in this defiantly optimistic mood he appointed the lukewarm Soult to take over command of the Army concentrating at Philippeville, and commandeering three of that marshal’s carriages, Napoleon and his staff set out for Laon. Meanwhile, Grouchy’s right wing, down to 25,000 men, which had been fighting General von Thielemann’s 17,000 Prussians at Wavre and Limale, on learning of the defeat the next day (the nineteenth), ordered a swift and brilliant withdrawal for his army via Namur and Givet. Having defeated the pursuing Prussians in two sharp if minor battles, Marshal Grouchy’s forces reached Philippeville on the twentieth, and were then taken over by Soult, giving him a grand total of just 55,000 troops-as opposed to Blucher’s approaching 66,000 and Wellington’s 52,000 men. But “Old Nick” Soult (as his officers and men facetiously referred to him), as cold, uncommunicative and solitary as ever, personally felt the situation following the debacle of Waterloo was utterly hopeless. He only wanted to escape while he still could, and giving orders to evacuate Philippeville, he continued with the French Army on its retreat for Soissons where, a few days later, pleading “ill health,” he in turn would hand over supreme command to Grouchy and in the best Napoleonic tradition abandon them all. By the time Napoleon himself reached Laon, after six o’clock on the evening of the twentieth, he had changed his mind again. He would not stay to rebuild the Army after all, he would go to Paris. He had to go to Paris to save the nation . . . and his throne. After traveling throughout the night from Laon, the dust-covered Emperor emerged from the caleche in the courtyard of the Elysee at 5:30 A. M. on 21 June, where he was greeted by a grim Foreign Minister Caulaincourt. 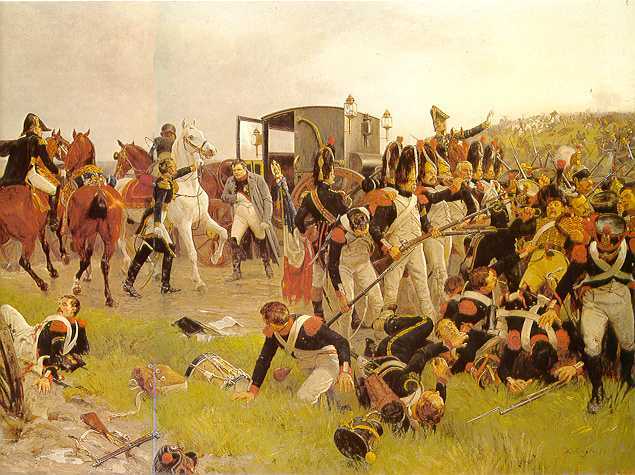 “If I return to Paris,” Napoleon had told General Bertrand at Philippeville, “and I have to get my hands bloody, then I’ll shove them in right up to the elbow!” Was that his solution, after having left 64,600 French casualties-25,000 dead and seriously wounded just at Waterloo and tens of thousands of horses and 220 cannon behind him in the fields of Belgium-was he now bent on bringing down the apocalypse on France as well? This entry was posted in Biography, France by MSW. Bookmark the permalink.